I believe the Muslim world needs a #NoHijabDay to return the power of choice to Muslim women! The hijab, more than any other cultural signal, is the most ready identifier of Islam today. Almost twenty years after 9/11, the world is still seeing a rise in Islamophobia. Islamophobes of the physically aggressive variety zero in on to these cultural signals and the hijab is the most obvious one. Hijab wearing women are victims of these attacks quite sadly possibly due to their perceived vulnerability. They need greater protection from the community. Although this piece will criticize and deny the hijab as a command from Allah, let me be very clear – I respect the right of any woman to wear whatever she chooses within the bounds of the law. 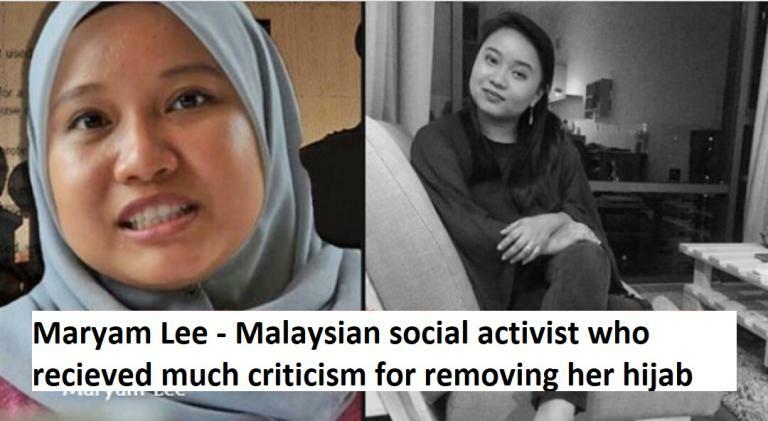 While I do not approve of the cultural invasion the hijab represents – my own native Malay culture has been changed beyond recognition thanks to the Arabization brought about with the hijab – I do acknowledge that this is a cultural democracy. If people choose to accept it, who am I to deny them that right? After all, for many Muslim women, the hijab represents their attempt to become modest and we must support them for that. What I am speaking out against is the attitude that Islamofascists take about the hijab. They tend to impugn women who do not wear it claiming they are ‘modernists’ or ‘liberals’ and worse, question their morals. This judgemental attitude is worsened by the fact that they claim that the hijab is an Islamic duty, overlooking the fact that, although the Quran does mention the word ‘hijab’, it never uses the word to mean ‘headcover’. This linguistic incongruence in itself should indicate the logical gymnastics required to prove that it is mandatory. There are actually many arguments against the hijab in my understanding of the Quran but that warrants an article in itself. In Malaysia, hijab-related politics has given room for the patriarchy to exert even greater control over women. Far from respecting the rights of women not to wear the hijab, they even attack the various styles of hijabs and some even insist that nothing short of the full face veil suffices. Worse still, when Malay-Muslims do wear the hijab, they are thus subject to the patriarchy’s criticisms in an attempt to control their movements. Last month, it was the case of the Malaysian Muslim entrepreneur Neelofar who launched her new style hijab in a nightclub called Zouk in the Malaysian capital city. It was an unorthodox place to launch such a product, to be sure, but the condemnations she received were far from warranted. Some even called her a disbeliever and called for strict punishment to be taken. In the end, she had to publicly apologize. The point here is not whether it was appropriate for Neelofa to launch her product in a nightclub. The point is, the fact that her product is associated with Islam, makes her accountable in the eyes of the Islamofascists. She is therefore subject to their control and must follow what they consider appropriate. So while they are ok with changing our cultural landscape, they are not OK with hijabis taking control of the hijab’s cultural trajectory. The Neelofar case is but a single issue in the long history of the hijab being used as a tool of the battle of the sexes. In Malaysia, there is a growing number of ex-hijabis who have decided to remove their hijabs and they face intense backlash from the Muslim community. One only needs to search for ‘Maryam Lee’ (social activist) or ‘Uqasha Senrose’ (actress) to see the glaring examples. ‘We stand with you. Even though we believe the hijab is a religious obligation, we choose to take it off today to stand with you. We deny the patriarchy their right to choose for us’. This can be a powerful message to the Iranian women who recently took off their hijabs and now face persecution. Dear writer, I understand your thoughts and the struggles you face by your community. If your community is oppressing you and fellow muslim women in the name of ,”hijab” and “islam” then they are absolutely wrong and have no knowledge of islam or the hijab. Encouraging a #NoHijabDay “to return the power of choice to muslim women” is not the best way to approach the world and the attitudes of such communities. The hijab is a personal choice and is NOT a religius obligation. Muslim women have been given rights way before by the Holy Prophet pbuh. It is not a burden and if your community is making you feel so, instead of encouraging a #NoHijabDay, consider fighting againts such communities and start empowering women about the true meaning and beauty of hijab that communities have failed to understand and teach. A ‘No Hijab Day’ is nonsense. Most women who wear hijabs or other Middle Eastern clothing, do so because of tradition, social and family pressure, who mostly don’t even understand about the Quran, but are guided by clerics who like to ensure that women are kept under control. There are women who are fighting against this tradition in countries such Iran, but have to suffer the consequences of daring to want change to the system imposed by men. The suggestion is that covered Muslim women are somehow superior to others, but that is hardly the case. It is not what is on the head but in the head that makes a person, but the doctrines by men have ensured that women are judged only by their looks and how they can be useful to their men. This attitude has existed also in the non-Muslim world, women have been battling against it for a long time and are battling still for equality and justice. Strange. All the hijab wearing ladies that I know where it because they want to. The ‘pressure of men’ does not enter into it at all. I do accept that some ladies are opposed to it in places where ‘force’ or ‘pressure’ is used. (pressure asks for counter-pressure). But in all the places where no pressure is used the ladies use the hijab freely. Yes, in some places it is fashion and not heart. But that is also free will. (My dear senior wife would definitely not have married me if I had insisted that she would NOT wear a hijab), Hijab wearing ladies: Please speak up and let Renate see what you feel about it !!! I agree that this is not a good approach to this problem. I am a Ahmadi Muslim women living in today’s society wearing a hijab out of free will and I am proud. My hijab protects me and I never once thought to wear it out of “pressure of men” or force. I will also never participate in a no hijab day because I would never be able to step out the door without my hijab. This is a personal right for a Muslim women to choose what she chooses to do and for us to do a no hijab day would be completely wrong, rather we can teach those who are wrong about the true Islam because what is happening in Malaysia is upsetting. I mentioned in one previous comment that my dear senior wife would not have married me if I would have said that she should take off the hijab. Just to be complete: My junior wife would probably have married me as she was young and not used to hijab in her home family. However later on she started to wear the hijab without any pressure from me. Now she has many friends without hijab, however, would not think of taking off her own. Pressure to wear hijab? I have not given pressure nor have I seen it among all my friends and relatives near and far. (I do not say that it does not exist at all. In countries like Iran and KSA there seem to be pressure, however, in the rest of the world ladies do what they want to do. As woman raised in the western world, I grew up facing the harsh realities a brown Muslim Hijan wearing girl would in an all white society from a very young age. I was not forced to wear it but the more I was discriminated against the more determined I was to keep my identity as a Muslim woman and it opened many doors of understanding to me. It helped me to understand that the hijab was indeed a part of me, it shielded me and got people to look beyond my physical appearance, it pushed me not to be stuck in materialistic ideologies, social standings, or parties/drug addictions and move forward to high Acedemic achievement. I saw in commercials, movies , videos , everywhere I looked that women were used merely as objects to increase sales, lure in customer and to make things look more seductive and desirable. Women are not respected, cared for, honoured, valued or even appreciated. So in my opinion, if a woman deems it fair that she wants to remove her hijab, than that is her choice, she should have the choice to do that and the freedom to do it too, no one should force her to wear it. But if someone want to wear it, than similarly she should have the choice and freedom to wear it and no one should be able to force them to remove it. The funny thing the woman who removed it, she was faced terrible criticism for removing it. So now she is putting all the women who wear it through terrible criticism as well to remove it. Is she taking revenge? Shouldn’t she sympathize with them because she know how it feels to be forced to do what you do want to do? She forcing them to remove their hijab which we don’t want to remove…. First hijab isn’t a cultural , it’s a religious matter and secondly if someone thinks like that and Practice her own religion without understanding, does not mean that there’s a problem in some religious matters because thousands and thousands people are practicing hijab willingly and by understanding the deep meaning of that practice. We feel more freedom and pride by practicing the hijab. No one should have that right to interfere someone’s religious freedom. The hijab is a choice and you should never be forced to wear the hijab or pressured in doing so. The hijab is worn by Muslim women for modesty and for protection. So, what is the point of a No Hijab Day? The purpose of the hijab is for modesty, and so this would defeat its sole purpose. I understand the purpose behind Hijab Day, so that women of other religions can experience the hijab, but removing the hijab and showing solidarity with non-hijabi sisters does not any make sense. I hope that women can make their own decisions without any societal pressure and their choice of wearing or not wearing the hijab should be accepted.